The manufacturing industry is one of the most competitive sectors, since it is driven by innovations. Thus, manufacturers are keen to exploit all those opportunities, which allow them to showcase their innovative products, meet industry leaders, and mingle with potential clients. Attending trade-shows is one of the easiest ways to achieve all these. 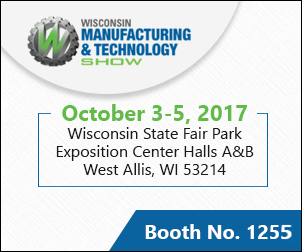 This is why Techna-Tool will be making its presence felt at Wisconsin Manufacturing and Technology Show (WIMTS) 2017 in Milwaukee Wisconsin, from October 3- October 5, 2017. The expo will be held at Wisconsin State Fair Park in West Allis, WI. Techna-Tool is exhibiting at booth #1255. Techna-Tool provides industry-grade tool and process monitoring systems, which are utilized by clients in metal cutting, packaging, machine building, and various other industries. The WIMTS attracts manufacturers and customers from all these industries. It means there will be lots of promotional opportunities for Techna-Tool. Is that all? No. The following are major reasons why Techna – Tool has decided to attend the event. Meeting Decision Makers: The expo attracts top decision makers in the manufacturing and machine tool industries. Thus, the team is looking forward to meeting the decision makers, and discussing the various innovative products with them. Strengthening the Market Position: Although the team has already made 90,000 installations worldwide, still there are lots of manufacturers and machine tool companies, which aren’t using their products. This event will provide several opportunities to the company to promote their products among new clients, as well as form alliances with seasoned professionals, and suppliers. Gain Insights into New Technologies: The event attracts manufacturers from various domains. This means there will be lots of technology-related information floating around. The team is not only looking forward to attend FREE technical seminars, but also interact with pioneers and industry stalwarts. Track Trends and Gain Competitive Advantage: Techna-Tool has always invested in state-of-the art machinery and equipment, and resources. However, that is not enough to take a lead. The expo will enable the team to track new manufacturing trends, and learn new techniques of resource, time, and money optimization. The Wisconsin Manufacturing & Technology Show (WIMTS) is the largest manufacturing event in the Wisconsin, offering 100,000 square feet of exhibit space for product displays, demonstrations, etc. With 5000 people in attendance, the expo encourages manufacturers to “Invest in Innovation”. In addition to showcasing their innovative products, manufacturers get opportunities to learn about new technologies, evolving trends, as well as other developments in their domain. They can attend product presentations, equipment demonstrations, keynote address by speakers, and several networking events. Don’t miss this opportunity to see innovative investments, and learning new techniques for smarter, safer, and faster manufacturing. Techna – Tool will be awaiting you at the booth #1255. This entry was posted in WIMTS. Bookmark the permalink.